RAPTOR DVH - Double Variable Helix - Primarily designed for high temperature alloy machining in materials such as Stainless Steel & Titanium. 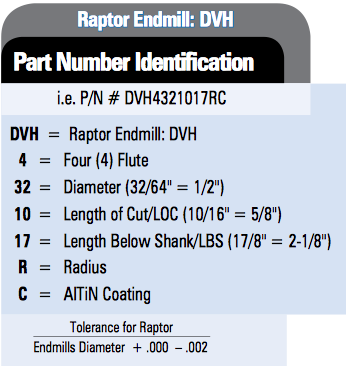 The Raptor DVH 4 flute and 5 flute end mills are ideally suited for SLOTTING applications as well as periphery machining operations in Stainless Steel and High Temperature alloys. 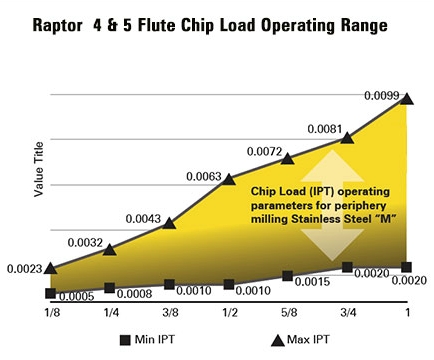 It can both rough and finish and provides a unique method of chip evacuation due to it's PATENTED double variable helix design. 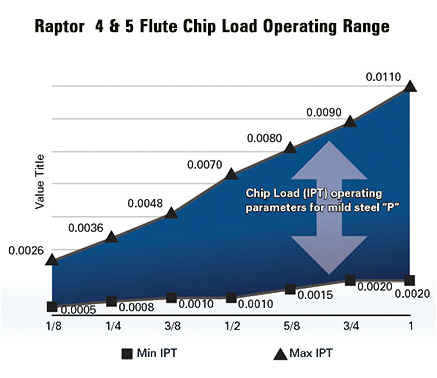 The “General Operating Range” is based upon 1X diameter (ADC / DOC) in full diameter (RDC / WOC) SLOTTING. 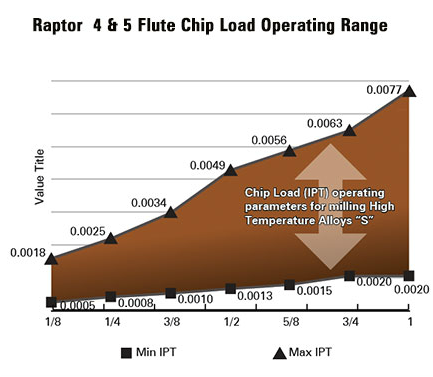 The minimum chip loads remain constant for all applications, however, the maximum chip loads can be increased for side milling applications in finishing, heavy roughing & light roughing. 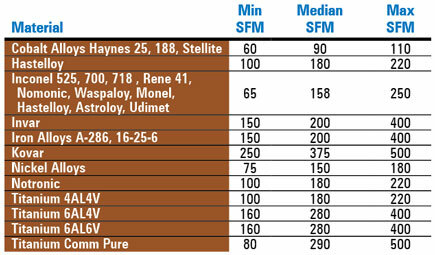 Remember to consider the Torque Efficiency of your CNC machine. The correct toolholder will improve production and reduce cycle time. Slotting Straight Entry: Reduce feed by 50% under at full diameter engagement. Slotting Roll-In Entry: Reduce feed by 50% under at full diameter engagement. Shown above is a LBS - Length Below Shank Tool - This is measured from the tip of the cutting edged to the full diameter of the shank that engages in the toolholder. Typically, it is equal to or less than the cutting diameter.